Though Bears may have scored a first-down, they are not very far along in advancing their ultimate campaign. It is likely they are still at their own 10-yard line - with a gargantuan 90-yard battle to win for a touch-down bottom to victory. Not only do Bulls still maintain mountains of steroidal-muscle and influence over the grid-iron at large, but they also have a formidable army of fans and officials working overtime to skew favor back to their collective multi-generational interests. On the other hand, it will be interesting to see the resultant outcome of official's attempts to reflate what has yet to be adequately deflated. As the above page extraction from Elliott Wave Technology's Interim Monthly Forecast clearly reflects, the time for pro-active traders and investors to have gotten defensive was in the summer and fall of 2007. Going forward, participants may get second chance to get defensive at higher levels, or it may also turn out such that the bullish contingent somehow prevails – prompting us to lift our currently defensive posture. Short-term leveraged trading is a highly speculative endeavor that entails significant levels of risk along with extraordinary levels of reward. To prevail in such an arena, one must not only adopt and stick with a winning discipline – but one must also accept that taking ones share of managed losses is a basic element of such engagement. 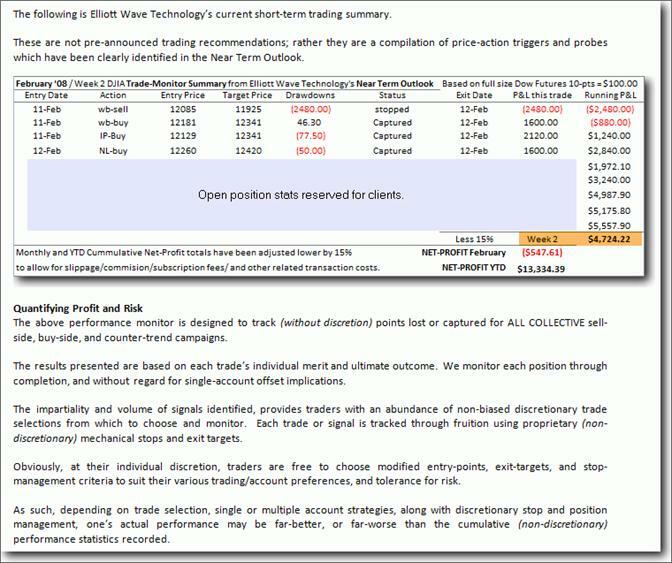 Below is graphic summary of previous week's short-term trade-triggers identified via Elliott Wave Technology's Near Term Outlook . Elliott Wave Technology's short-term market forecasts provide an outstanding roadmap of the dynamic price action landscape five days per week. The Near Term Outlook provides an excellent platform from which speculative short-term traders may better execute their strategies, mitigate risk, and maximize profits. Short-Term Trading Environment: Week ending 15-Feb.
Ironically, the faster markets traverse amid their expanded daily ranges, the slower the larger degree wave counts take to unfold. As the stakes get higher, the premiums and risk to participate in these moves rises accordingly – and so do the rewards. Re-Capping last week's trading points: Following the mayhem and hi-jinks incited by the crisis intervention and emergency rate-cuts some three weeks ago, markets have settled down – albeit in a much larger, more volatile version of its former self. Sparing the blow-by-blow details of the previous two weeks, our non-discretionary short-term trading discipline has captured over 500 points in the Dow in the week past, recovering most all of the losses experienced earlier in the month. We are going to begin this broad market outlook from the value perspective of Gold - one of the last remaining stable benchmarks of equal weight and measure. The chart below translates the value of the Dow Jones Industrial Average when measured against the Gold value. Copyright © 2008 Elliott Wave Technology. All Rights Reserved. Joseph Russo, presently the Publisher and Chief Market analyst for Elliott Wave Technology, has been studying Elliott Wave Theory, and the Technical Analysis of Financial Markets since 1991 and currently maintains active member status in the "Market Technicians Association." Joe continues to expand his body of knowledge through the MTA's accredited CMT program.